Joe Mackall's new book, "Plain Secrets: An Outsider Among the Amish," explores the role of religion in modern society by looking closely at the life of a small devout religious community in Ohio: the Swartzentruber Amish. The struggle of the Amish people to live with "the English" (the non-Amish), and of the English "outsider" (Mackall) to understand the Amish, is a unique story of culture crossing in rural white America. The complexity of the bridge that Mackall attempts to build between the Amish and English cultures is mirrored in the Latin root of the word "religion" -- religare, to bind together again. This is the problem/promise that Mackall confronts: Religion can both liberate and indoctrinate, both create a community through the bonds of tradition and doctrine, and enslave a community through the binding of minds and control of behavior. The book points to a difficult truth: A religious community is bound to be freed. Mackall explores this paradox with rare honesty and insight. In the introduction he describes the challenge of getting beyond the romanticized greeting-card version of the Amish (simple farmers who reject mainstream consumer culture) and the sensationalized fanatical version (the ethnic religious minority that refuses to assimilate). Both versions, he says, "reveal more about what outsiders need to see in the Amish than who they actually are." No writer can capture the reality of Amish life, of course, but Mackall achieves what he promises, which is to "push beyond surface perceptions" and "mine the raw material of their everyday lives in search of everyday truths." An English professor and journalist, Mackall writes as a kind of participant observer. For more than a decade he has befriended an Amish neighbor, Samuel Shetler, his wife, Mary, and their large family. His often complex relationship with Samuel, who is a farmer and minister, becomes the reader's window into the culture of the strictest of all Amish sects. Technologically, the Swartzentruber Amish still live in the 19th century: no indoor plumbing or central heat (only wood), no cars or tractors or telephones or refrigerators or freezers. Their buggies have wooden wheels and no windshields. They do not use the slow-moving-vehicle sign for trips after dark (though they are required to by law); the glowing orange triangle is viewed as too brightly colored and too much "of the world." 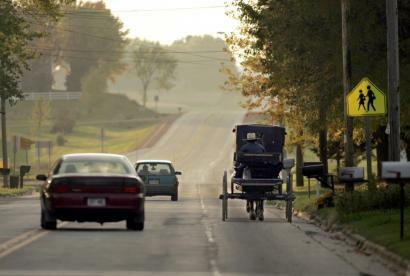 Though buggy accidents are common, the Amish trust God to keep them safe. In one section Mackall describes a buggy ride with Samuel on a hot July day to a nearby Home Depot to pick up supplies. It takes them 90 minutes to go 10 miles. Mackall is uneasy as the cars roar by: "We roll along at five miles per hour when the horses are walking, ten to twelve when they begin a trot. . . . The rush and power of the cars flying by frightens me and, quite frankly, [infuriates me]. Although I have done it thousands of times myself, I'm angry that people out here pass buggies like they're not even there, ignoring the danger and frightening the horses." As he does throughout the book, Mackall then seamlessly moves from his experience to analysis, to how the Amish buggy serves as both a "badge of ethnicity" for outsiders, and as a means of self-definition for the Amish themselves. (Will the buggy have battery-powered lights or kerosene lanterns, rubber or steel-lined wheels, cushioned or cushionless seats, one horse or two?) This reminds readers of a central Amish tenet -- technology encourages mobility, which threatens community, which is the heart of Amish culture. A car, with its gas-powered engine, is much more threatening to the stability of the Swartzentruber community than a bicycle with its chain and sprocket. A bike is more threatening than a kick scooter. Another strength of the book is that while maintaining a personal narrative voice, Mackall folds in a succinct and engaging history of the Anabaptist religious tradition and the polity of the Amish church. This added context greatly enhances the more personal stories. Twice per year the Swartzentruber Amish hold a formal meeting to discuss, revise (if need be), and agree upon their Ordnung -- a set of church rules for community behavior. It deals with everything from the prescribed size of a boy's hat brim (3 inches) to the process of shunning (the "loving rejection" of a community member for disobeying the Ordnung). This set of rules for conduct differs widely depending on the community -- whether it is the New or Old Order Amish, the Miller Amish, the Swedish Amish, or the Swartzentruber Amish. Shunning is the one Amish custom with which most outsiders are familiar. Mackall reveals the cultural power of this practice in a complex second narrative line, about Samuel's nephew Jonas, a teenage member of the Swartzentruber community who longs for the freedom and opportunities in the "English" world. Jonas doesn't feel "bound to be freed" by the tight-knit community, but simply bound. He wants to break away, finally does, and then is shunned. At one poignant moment, Jonas's father refuses to see him, seemingly choosing the church over his son. But what is most interesting about Jonas's journey away from Amish culture is that it is artfully interwoven with Mackall's journey toward the culture. Jonas is an insider trying to get out, and Mackall is an outsider trying to get in (or closer) to the Amish community. The braid of their personal stories parallels the broader struggles between the two cultures and leaves readers where I assume Mackall wants them -- standing in the middle of the cross-cultural bridge he has built with his Amish neighbors, able to clearly see both sides. Tom Montgomery-Fate is a professor of English at College of DuPage in Glen Ellyn, Ill., and the author of "Steady and Trembling: Art, Faith, and Family in an Uncertain World."